In 2006 the National Oceanic and Atmospheric Administration (NOAA) was charged with the creation of a universal phonebook – or registry – of all current saltwater anglers in the United States. The registry was developed to allow NOAA to quickly and easily contact current saltwater anglers in an effort to gain more accurate and timely information on recreational fisheries. States were allowed to establish their own registry program for saltwater anglers that fished in their state. 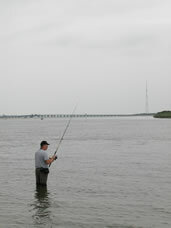 The New Jersey Department of Environmental Protection established its own registry program, the New Jersey Saltwater Recreational Registry Program, to exempt saltwater recreational anglers fishing in New Jersey’s marine and tidal waters from the federal registry and the $15.00 federal registration fee imposed in 2011. The Department of Environmental Protection (DEP) implemented the New Jersey Saltwater Recreational Registry Program (NJSRRP) effective May 4, 2011 through Administrative Order No. 2011-05. This Registry is NOT a License. New Jersey does not have a saltwater license. All Marine Fisheries Rules and Regulations must be followed at all times. For more information on the New Jersey Saltwater Recreational Registry Program, please refer to our Frequently Asked Questions (FAQ) page. NOTE: Anglers with a valid registration with the National Saltwater Angler Registry or have a valid license from another exempted state are required to register (for free) with the NJ Saltwater Recreational Registry Program. Registration with NJ will exempt you from having to register with the National Saltwater Angler Registry. WHAT DO I NEED TO PROVIDE IN ORDER TO REGISTER? If registering as an individual you will need the last four digits of your social security number in addition to your name, address, date of birth and phone number. Emails are optional, but providing one will permit the computerized registration system to send you a confirmation of your registration. Click on the "New Registration" button or "Renew Any Registration", if you've been registered before and it will take you right to the registration page. If registering as an owner/operator of a For-Hire Vessel you will need to provide the last four digits of your social security number, your name, address, date of birth, phone number and either the United States Coast Guard Documentation Number or the Registration Number and state of the Vessel you are registering. If your boat has a name you should also provide that information. Click on the "New For-Hire Registration" button or "Renew Any Registration", if you've been registered before and it will take you right to the registration page. If you do not have a Social Security Number for this registration purpose you will be considered a non-US resident. You will then have the ability to input your passport number and country of origin. For any other questions please refer to our Frequently Asked Questions (FAQ) page. CAN I CHANGE MY CURRENT REGISTRATION INFORMATION? Do you need to update your registration because your contact information has changed? Do you need a duplicate registration card? Do you want to review your current registration information? Did you make an error when registering and need to delete the current registration and resubmit a new one? Do you need to renew your current registration for the next registration year? All these tasks can be done by clicking on the Access Current Registration link below. This website was prepared by the New Jersey Department of Environmental Protection under award number NA10NMF4740124 from the National Oceanic and Atmospheric Administration, U.S. Department of Commerce. The statements, findings, conclusions, and recommendations are those of the author(s) and do not necessarily reflect the views of the National Oceanic and Atmospheric Administration or the Department of Commerce. This service requires Microsoft Internet Explorer version 7.0 or later, Mozilla Firefox version 3.5 or later, or Apple Safari to operate correctly. It will not work with any other web browsers such as Google Chrome. Failure to upgrade to the correct browser version will cause data to display incorrectly and may disable some functionality.